Objective: utilize a Trackmobile in a setting where it normally would be found. An example of switching totally dependent on a Trackmobile for motive power was a barge-served terminal on the Canadian National at Penticton, BC on Lake Okanagan. Industries included the freight house, team track, oil company, warehouses, and a Canadian Pacific interchange. 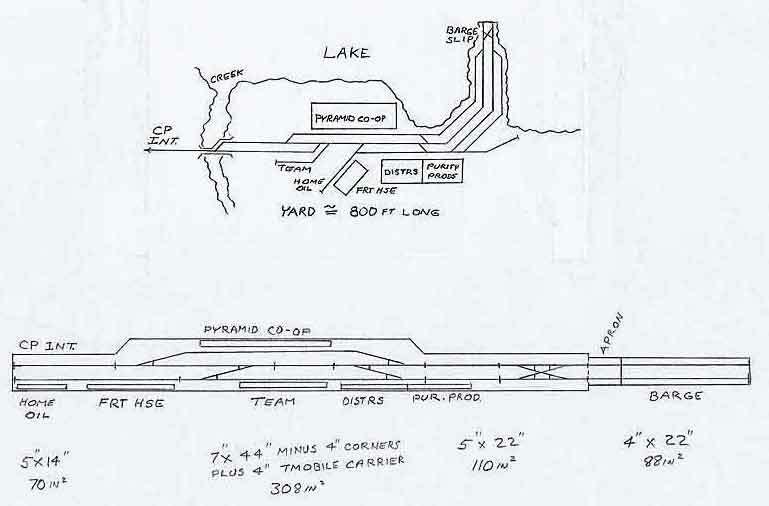 The drawing includes a schematic of the prototype and the layout as designed. The layout is functionally a schematic, all prototype industries are included, and are represented by loading docks without buildings. The barge landing ends with a 6-car barge. The entire yard area was “paved” with dirt, timbers, or a combination of the two. The switch at the west end of the yard was on a bridge with a rail-height deck to facilitate Trackmobile operation. All switches were planked, and much of the trackage had timbers inside and/or outside the rails. Traffic was typical of a small agricultural community. Operation would entail moving cars between the barge and industries according to a car-movement system. Since spotted cars would frequently block switches and various tracks — as they did on the prototype — it will be necessary for the Trackmobile to “rubber” from point to point in the yard. This is accomplished by picking it up in a carrier similar to Peco’s Loco Lift and transporting it to the point where it returns to the rails to move the rail equipment, exactly as the real thing was driven from point to point during switching.